Christmas is of course associated with the colours green and red. Both for good reasons. Of course, Green is associated with Christmas Trees and brussel sprouts (yuck!). Whereas, Red is associated with Santa Claus and the aspect of presents. Red bows on the Christmas wreaths and baubles to decorate the Christmas tree. What is beautiful about Christmas time is the types of looks that come with it. This leads me nicely onto an affordable nail polish that I am in absolute love with. I picked this up on whim for Halloween actually, but never got around to using it. But it is perfect for Christmas. 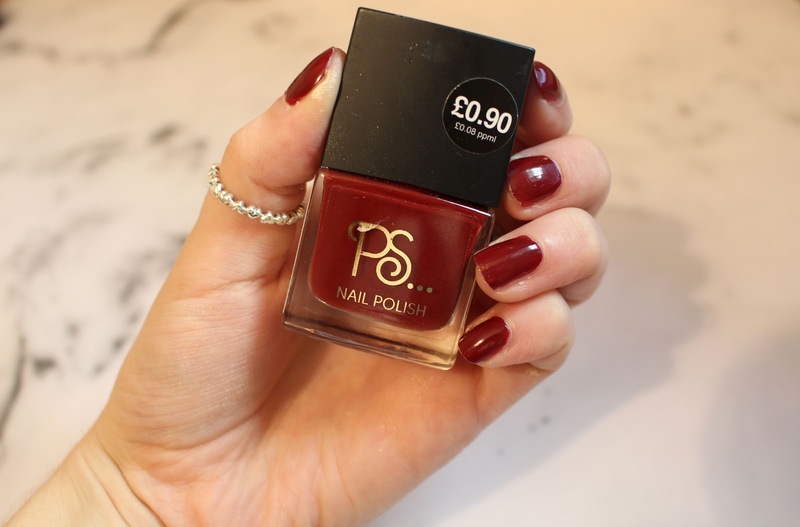 This is the Primark PS… Nail Polish in the colour Dark Red. What's amazing about Primark product's is how affordable they are, and also, they are generally of good quality. The nail polish range is quite extensive and they have many colours for you to chose from. This deep red colour is very opaque, so much so that you only needed two coats to create the perfect look. Amazingly it also dried very quickly, something which I hate about most nail varnishes, I tend to not put nail varnish on because I can never be bothered to wait for it to dry. It takes too long and I become very impatient. However, by the time I had finished my second hand the first was dry and ready for the next coat. This is great and also means it's the perfect colour for me to take out with me in case I happen to chip a nail - which is a constant for me! What makes this product even more amazing is that it's only 90p! What is your favourite nail polish colour?